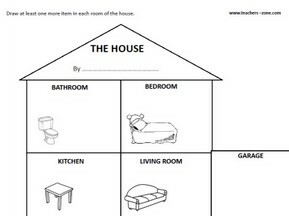 I would like to present some ideas to practice rooms in the house vocabulary with young learners. They can be used with both small and big grups of students. They are proper for groups where students have different level of language skills as well. Puzzles 3D or doll's house is a graet fun for children to practise names of the rooms or furnitures and objects in the house. You can ask students to prepare furnitures with given elements and put them in the right room. At the same time they call furnitures they make and name the rooms where should they go. If you do not have such a toy make a poster of the house and cut out paper furnitures. It can be one poster for whole group or several posters for smaller groups. Children colour and stick objects to the right places. Students with writing skills can not only stick furnitures but also label them. It is a good oportunity to encourage children to use picture or bilingual dictionaries.